Addictive (#5) is going to be a very short price off her visually impressive score against open company at Tampa Bay Downs in her debut. 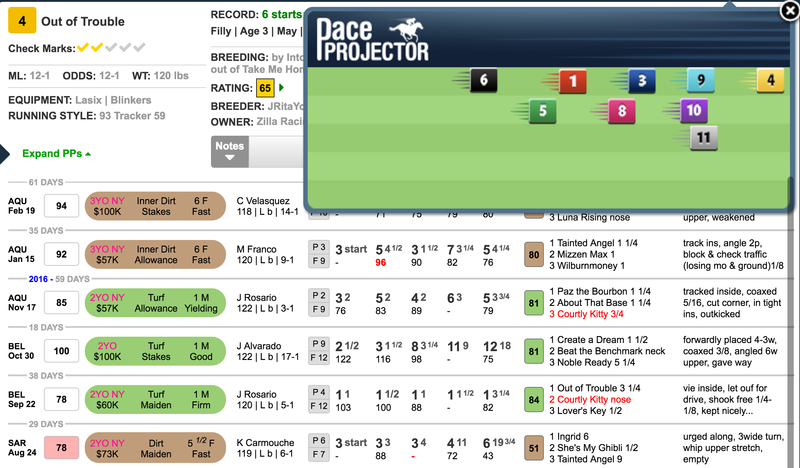 However, she did not beat a strong field that day, and she’s going to have to show better early speed to be competitive in this spot after breaking very slowly in her first start. I feel that she’s going to be an underlay, so I want to consider some others. There are a couple of interesting fillies shipping up from Gulfstream Park. Bonita Springs (#3) is taking the most significant class drop after racing against open company N1X allowance foes in two straight starts down south. While she couldn’t threaten for a major award in either of those races, she was beaten by some talented fillies, a few of whom have moved on to stakes company. I also want to use Tiz a Kitten (#6), who appears to finally be putting it all together for the ever-dangerous Mike Maker. This Kitten’s Joy filly showed potential in her initial start in New York last year, but then took a while to find herself in subsequent races. She’s stepping up in class, but her last effort was quite good. Both of the aforementioned fillies are intriguing, but if we’re going to upset the favorite, I think the best option is OUT OF TROUBLE (#4). This Kiaran McLaughlin trainee is projected to control the pace up front in a race that is lacking other confirmed front-runners. Her turf races are actually better than they seem. She was cooked in a fast pace against much tougher company in the Chelsey Flower. Then she encountered traffic trouble in November at Aqueduct when trying to make a run up the rail in the stretch. Her recent dirt races – especially her troubled effort two back – suggest that she may have improved since then, and the price figures to be inviting today.